Which web browsers does Clipchamp support? Clipchamp products works best in Google Chrome on laptop or desktop computers. Our service pushes web browsers to their limits by using many bleeding edge technologies. Different browsers support those technologies to a varying degree and sometimes not at all. Our Clipchamp Create editor is currently only supported in Google Chrome on desktop and laptop computers. For Clipchamp Utilities our engineering team has worked hard to support all the major web browsers out there, however for the time being we fully support recent releases of Chrome, Firefox, and Opera. Edge, Safari and Internet Explorer 11 are partially supported. It does not work on mobile devices. Our Clipchamp Collect API and WordPress plugin support video recording and uploading in Chrome, Firefox, Edge and Safari on desktops and laptops, and in mobile Safari (iOS) and mobile Chrome (Android) on mobile devices. 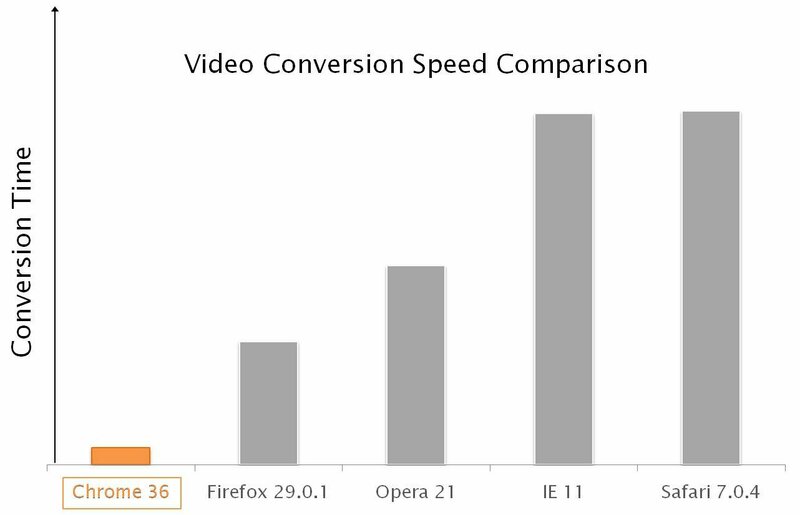 The chart below shows the significant speed advantages of using Clipchamp in Chrome over other browsers for video conversion. The stats are from 2015 when we ran this test initially, however the speed comparison results still apply today. Please note: the browsers mentioned here are those that our Utilities compressor and converter tool supports.